Three weeks ago, Kevin O’Keefe posted a question on Facebook – the corresponding answers, of which there were 21, dug deep into SEO theories concerning duplicate content, canonicalization, rewritten summaries, excerpts, site authority and Google Panda penalties. Anyone else looking at re-posting blog posts from your blog on LinkedIn’s publishing platform? I could see lawyers and other professionals wanting to re-post a blog post from their blog to “LinkedIn Publishing” and — and vice versa. I see some people even advising to auto-post content from your blog to LinkedIn — though I am not certain how that is even possible, unless they are just referencing sharing versus publishing. LinkedIn publishing content appears to be indexed by Google. That would seem to create problems with duplicate content for the lawyer’s blog, the risk being that LinkedIn’s version would outrank the blog post on a search for the matter covered in the piece. LinkedIn’s describes their publishing platform as The Definitive Professional Publishing Platform (their words not mine) by showcasing content from influencers in the LinkedIn network. During 2014, LinkinedIn opened up publishing from a select few thought leaders to more and more of its network. LinkedIn, with its very strong authority, is stealing SEO traffic from my blog by utilizing my own content. The Google might see my content copied onto LinkedIn, believe the original version (known as canonical) was the LinkedIn version, further deduce my site is full of nothing but syndicated content and whack my website traffic with a duplicate content Penalty (aka Panda). Concerns about duplicate content are exacerbated by the use (or misuse?) of canonical tags by LinkedIn. Canonical tags were specifically created to identify the original (or canonical) version of content – specifically syndicated content. LinkedIn self-servingly automatically generates those canonical tags on content in their publisher platform. You can see the rel=”canonical” tag highlighted below in the code for the article I published on LinkedIn, despite the fact I had just cut and pasted the content verbatim. So we come back full circle to Kevin’s Question. What does The Google do when I copy my blog posts to LinkedIn Publisher? What the what? Oh LinkedIn . . . . ? Where are you LinkedIn . . . . ? Nothing. No mention of LinkedIn at all. 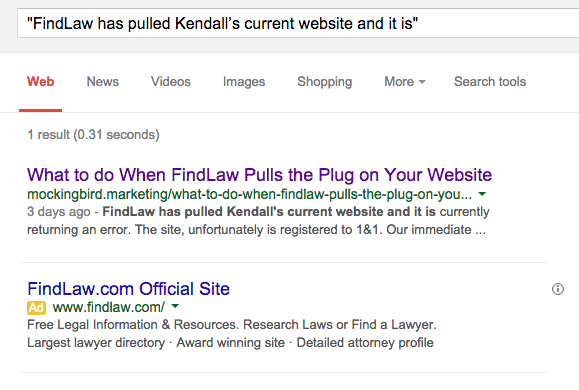 (Sidebar – the FindLaw ad is a little funny; I couldn’t help myself.) And apologies for getting a little geeky but you’ll note there’s nothing showing as suppressed results – which means that The Google hasn’t even indexed the LinkedIn page. I got the exact same results for both posts. I then rechecked the results 2 weeks later. Same exact thing – no LinkedIn. But perhaps, this is unique to Conrad’s specific situation. So I ran 3 more legal blog postings from different firms. Same results (or lack thereof). 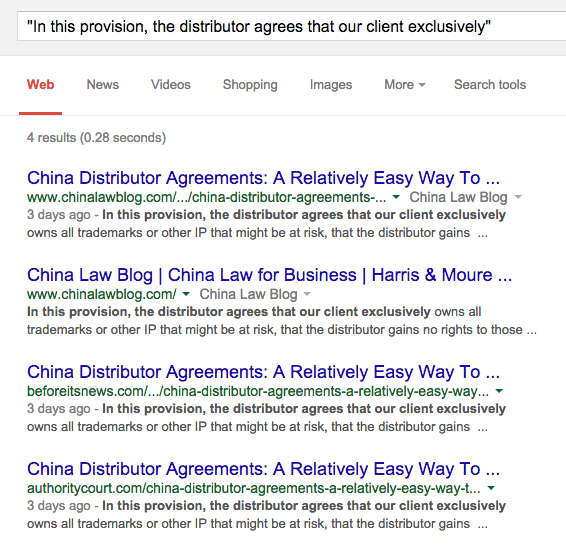 Here’s an example of the results for content on a Chine Law Blog that appear verbatim on LinkedIn. Note the two results at the bottom are syndicated and originally showed up as supplemental results. But again. No LinkedIn. Not even in supplemental results. Now, I haven’t done a comprehensive study, but so far 5 out of 5 data points tell the same story: publishing on LinkedIn won’t cause LinkedIn to steal your traffic nor will it incur the wrath of Mountain View based Pandas. This of course, makes a ton of sense to me – – – I can’t imagine that the brainpower at The Google hasn’t figured out how to handle this very common widespread issue. Its not like syndicated content is an entirely new concept. Note that LinkedIn does aggressively push content in front of your LinkedIn network – so republishing does have real value even if that value doesn’t originate from SEO (gasp – did Conrad really just say that?). If you are still paranoid – just duplicate the experiment above for your own stuff; but as far as I’m concerned – ignore the SEO ballyhoo. The only thing publishing on LinkedIn will do is to get your established network to read your content – which doesn’t seem like a bad idea after all. I did the same tests and my results were identical. 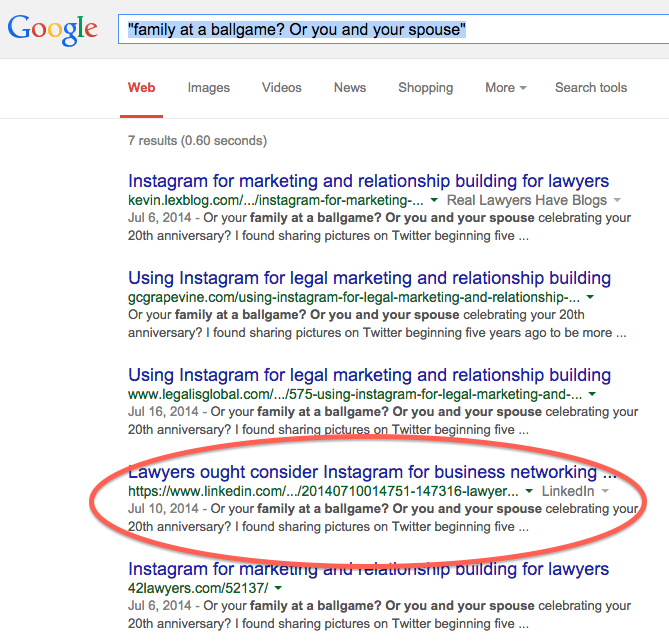 My blog post came up on Google’s organic search rankings but LinkedIn’s did not. Also, posting on LinkedIn helped my content get eyeballs, reviews, raves and comments from my peers and network. This is gold. Thanks for sharing this test and informative post. To my oft-repeated point exactly, Conrad…which is that LinkedIn’s publishing platform is “rented” space. Ok to post there, and to repost, but for the real juice, you’re better off driving eyeballs from the LI post to your owned property (blog, website, landing page, etc.). If LI shut its doors tomorrow, gone would be all of your posts. Ignore their hype about being “The Definitive Professional Publishing Platform” (they wants eyeballs too) and do the smart thing, people. So I had written an article called “McDonald’s Brand:Contrived and Confused” on my company’s website a week before I re-posted it on LinkedIn. A week later, I posted it on LinkedIn, and it received around 10k views compared to the 20 views on our company website. For that reason alone, I believe this is why when I google my article, the LinkedIn version shows up first. I’d post an image if I was able, but you can search for it and see for yourself. Any idea on why this is happening?